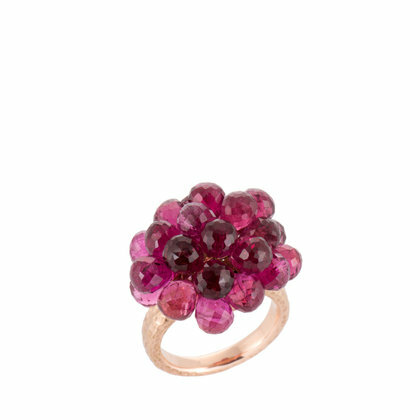 Natural, pink tourmaline briolettes set in 18kt rose gold form an exuberant explosion of colour. Briolettes are stones cut with myriad facets - each tiny facet catches the light, with the effect that the stones sparkle brilliantly. This statement cocktail ring is handmade with exquisite care and precision so that the briolettes also shimmer gently as you move. Handmade in London's Hatton Garden with a lot of love & expertise, and hallmarked by the Goldsmith's Assay Office.